National research rankings recently released by the National Science Foundation (NSF) place psychology at UConn 16th in the country in total research expenditures, a measure of research funding, and 10th nationally in federal research funding. While the survey ranked only the top 100 institutions in the nation, there are more than 200 graduate programs in psychology in the United States. UConn’s ranking of 16th for total research dollars places it just behind Carnegie-Mellon University. The ranking of 10th for federal research grants places UConn close on the heels of the University of Minnesota, which had 55 psychology faculty in 2003 compared with UConn’s 36. The University of Wisconsin at Madison ranked first in both categories. The grants ranking helps UConn attract the very top graduate students, says Charles Lowe, head of the Department of Psychology. 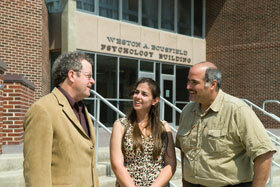 “We are competitive with the very best psychology departments in the country,”	he says. The grants also help support a national trend to involve undergraduate students in research. For the past two years, more than 400 undergraduate psychology majors have worked with a faculty member and graduate students as part of a research team, says Lowe. “We constantly make the connection between excellence in research and teaching in the liberal arts and sciences,” says Ross MacKinnon, dean of the College of Liberal Arts and Sciences. The NSF survey is based on figures from fiscal years 2000 through 2003, and is the latest ranking the agency has done. It showed nearly $33 million in total research award expenditures by psychology at UConn during those four years, and nearly $22.5 million in federal grant spending for that period. The research expenditures document how much money was spent in each fiscal year on a research grant. Large grant awards often span several years, so total grant awards to researchers usually exceed yearly expenditures. The rankings include all psychology research at UConn, covering grants to the educational psychology department in the Neag School of Education as well as the psychology department in the College of Liberal Arts and Sciences. The NSF reported nearly $11 million in total research fund expenditures in 2003 for UConn, a 38 percent increase over 2000, and more than $8.5 million in federal research grant spending in 2003, a 103 percent increase over 2000. The increases are due to more research grant applications in the area of health, says Lowe. Most federal grant funding for research in psychology comes from the NIH. The Center for Health, Intervention and Prevention (CHIP) in the psychology department, which began as an AIDS risk reduction project and became a multidisciplinary center in 2001, has attracted major national research funding. Researchers in the department also attract large grants for research into Alzheimer’s disease, autism, and Parkinson’s Disease, among others. The CHIP program alone received $28 million in external research awards from fiscal years 1999 through 2005, a total that includes $6.7 million in indirect costs contributed to the University, and it recently reported a 38 percent increase in grant awards from fiscal year 2004 to fiscal year 2005. Of the $8.5 million in federal grant spending attributed to psychology at UConn in 2003, $2.6 million was garnered by the Neag School’s educational psychology department. Psychology professor David Kenny, left, and Professor Seth Kalichman, the two principal investigators on a new NIH training grant, with graduate student Lisa Eaton, who will be one of the first to work in the grant program. The psychology department received an additional $1.8 million in federal funding that year that was processed through the Haskins Laboratories in New Haven, a non-profit research institute, and therefore did not count in the NSF totals for UConn. Including research done through Haskins, the psychology department had a total of $7.7 million in federal research expenditures in 2003. The grant funding increases are good news because they ultimately yield an increase in research productivity, a key measure in how the National Research Council rates graduate programs, says Lowe. An increase in grant dollars also provides more resources through indirect costs to the University. Last year, psychology research grants provided $1.8 million in indirect costs to the University. Beyond that, increasing funding “is contagious – it creates a pervasive and very positive atmosphere,” he says. As more grants are awarded, more faculty and graduate students seek and are awarded grants, a phenomenon he attributes to role modeling and mentoring. The number of grant proposals this year increased from 30 to 56. “This department somehow has created an atmosphere that doing research is important,” Lowe says, and that, in turn, attracts top undergraduate students to major in psychology. Among the most recent grants to the psychology department is an $800,000 training grant from the National Institutes of Health to the department’s social psychology division. The five-year award supports a program to train graduate students in the social processes of AIDS. Students will be dually mentored by faculty whose research focuses on AIDS and by faculty whose research is in the areas of gender and stigma, social discrimination and poverty, or dyadic processes – how pairs of people interact in social relationships. These are core areas of psychology that few researchers have focused on in AIDS research to date, says Seth Kalichman, a professor of psychology and one of the principal investigators, whose work is on AIDS. The co-PI on the grant is David Kenny, also a professor of psychology, whose research is on dyadic processes. Students will enter the program after one year of graduate school and will participate in it for three years. The first two students will begin this fall.